Location/ Directions: I-24: Take exit 111, 10 miles on Highway 55 to Tullahoma, turn right at the intersection of Highway 55 and 41A (also known as Jackson Street), 3 miles to the hotel. The Street location is between the Waffle House and Ruby Tuesday restaurants on the right side of the road. About Hotel: 3-Floors, 62-Rooms, Interior Corridors, No Pets Allowed, Free hot breakfast, Free high-speed internet access, Coin Laundry, Elevators, News Stand, Room Service, Business Center, Fitness Room, Pool, Cribs, High chairs, Easy to Set Alarm Clock Radio, Coffee Maker, Iron/Ironing Board, Lap Desk. Railroad View: Excellent View. A room on either side of the building will provide a railroad view. 2nd & 3rd floors are best. Railroads past Hotel: CSX Transportation. Photo Comment: The above left photo shows the Hampton Inn to the right, and the single track railroad to the left (runs along the road). This photo looks south down Normandy Road. 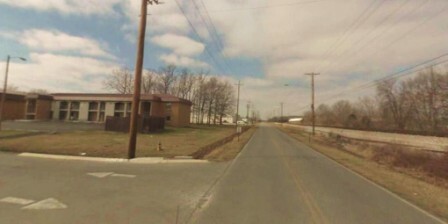 The main road that the motel is located on (North Jackson Street) is out of view to the right. 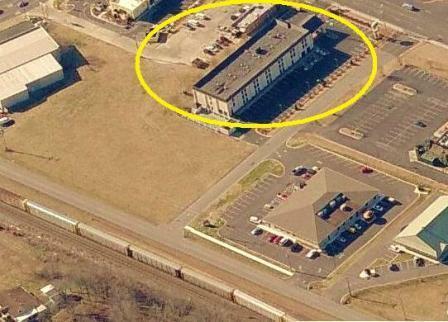 Aerial photo (above right) shows the Hampton Inn circled in yellow. Notice the clear view between the railroad & the motel. Any room in this motel should offer a railroad view, higher floors keep you above the parking lot. In the picture, a CSX powered Auto-Rack train passed the motel. Location/ Directions: I-24 East to exit 111, follow Highway 55 South to Tullahoma approximately 12 miles, go right on North Jackson Street one mile. 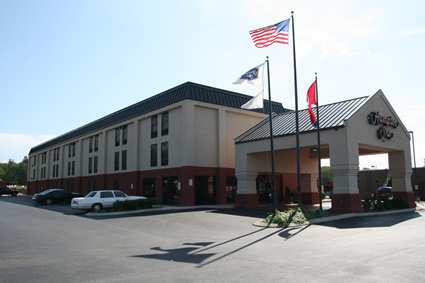 Hotel is just past Tullahoma High School on the right between Snap Fitness and Radio Shack. About Hotel: 2-Floors, 50-Rooms, Exterior Corridors, Bus & Truck Parking, Business Center, Exercise Room, Free Newspaper Mon-Fri, No Pets Allowed, Outdoor Parking, Seasonal Outdoor Pool, Free Hot Breakfast, Cable/Satellite TV, Free Coffee, Free Local Calls, Free Wireless High Speed Internet Access, Hair Dryer, In-Room Coffee Maker, In-Room Desk, Individual A/C & Heat, Iron & Ironing Board, Microwave, Refrigerator, Wake-Up Service. Railroad View: For an Excellent View, you need a room the the building in the rear of the motel. (along North Atlantic Street). The double track railroad is just across the road. Photo Comment: Left Photo: This photo looks north down North Atlantic Street. The railroad can be seen to the right. The only building owned by the motel that offers a railroad view is seen to the right. A second floor room will be your best choice for a clear railroad view. 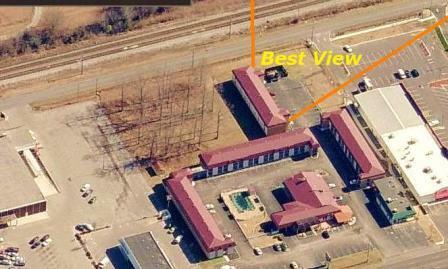 Right Photo: The aerial picture shows the four motel buildings (red roofs). Only one building, the closest to the top of the photo offers a railroad view from the room. The other buildings do not have windows on the railroad side. I am unsure of the type of rooms located in that building, a call to the motel beforehand would be wise to ensure an available room in that building.